Dec. 1984        Received Silver Acorn award from Gov. 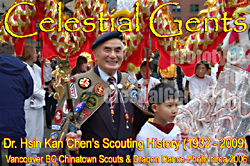 Gen. Jeanne Sauve for "especially distinguished service to scouting"
Nov. 1989        Wrote booklet on "Chinese Scouting of Greater Vancouver and Victoria, 1928-1988"
1994                Camp Chief of the Chinese Canadian Scout Jamboree, Camp Byng, Sechelt, B.C. June 2002        Wrote the book, "B. P. Trail and Beyond: The 1st Victoria Chinese Troop"